I always like to take a look at the big picture. 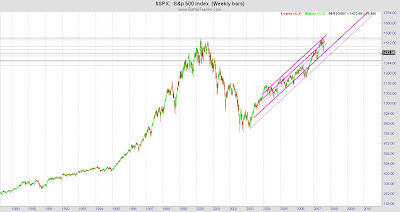 The news reported 1400 was the big # for the S&P. Learn to read a chart. The 1553-1557 range was the more important number. Why? In March 2000, the all time high was in that range. THAT'S why that's so important. I don't know why they really get 1400. Perhaps the people that report or write for the reporters to read don't really understand how to read a chart? Anyway, that's the big picture. Now as we take a look at the S&P, it's more reflective of the market because it's comprised of 500 stocks, rather than just 30, like that of the DOW and so concentrated. IMHO, the S&P represents a greater portion of the market than the DOW, but the DOW is talked about so much more, to me. 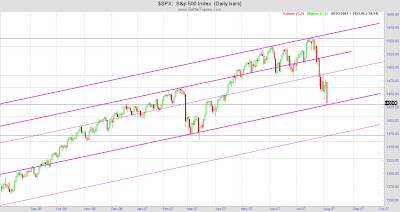 My other chart of the S&P was very messy, so started a new chart and drew new lines and this looks so virgin and makes things so much clearer. 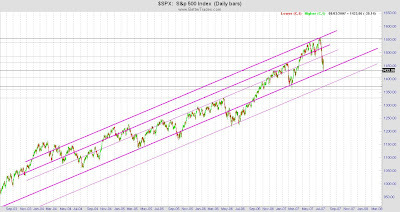 Don't tell me the markets aren't manipulated because you can see from the pattern, it is highly manipulated. What will the market do? Tumble down to the 1375 range? Tim would like that wouldn't he? Either way, it doesn't matter. This looks like a good pivot point or they could blow right past through this. Again, if it reverses and heads back up from here, it would make sense. 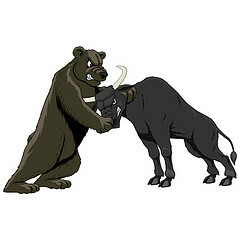 My other technical indicators show there could possibly more movement to the downside, or it could reverse here. One thing about trading neutrally is it doesn't matter. I could be a bear now, but easily switch to being a bull.